Greg London of the Sarpy County Sheriff's Office said Sunday that one levee broke Thursday along the Platte River, and another broke Saturday. He estimates that up to 400 houses and cabins in the area known as Hanson's Lake are damaged, including many that are completely submerged. Another 100 or so homes are damaged elsewhere in the county. The area is near where the Platte and Missouri rivers converge. A Missouri River levee nearby also breached on Thursday. London says many of the damaged homes are likely ruined. He says that while the area has had flooding before, this year's disaster is "unprecedented." This update has been corrected to show the name of the county in Nebraska is Sarpy, not Sharpy. Flooding has reached record levels at 17 locations across Nebraska. The state's emergency management agency says more record crests are expected in various rivers by Tuesday. Nebraska has had much of the worst of the late-winter flooding that's been seen across the Midwest. Hundreds of homes are damaged and the state says 660 people are staying in shelters. The Nebraska Emergency Management Agency says the Missouri River is expected to crest Sunday at 41 feet (12.5 meters) in Plattsmouth — 4 feet (1.22 meters) above the record set in 2011. Serious flooding there is expected to continue through next weekend. Crest records also were set along the Platte and Elkhorn rivers. The Elkhorn reached 24.6 feet (7.5 meters) Saturday in Waterloo, breaking the 1962 record by 5 1/2 feet (1.68 meters). Nearly 300 people have been rescued from high water across the state. At least one person has died in floodwaters in the state. A second death from flooding was reported in Iowa. Officials say residents of Green Bay, Wisconsin, who evacuated their homes due to flooding can return. Heavy rainfall and melting snow have led to dangerously high water in creeks and rivers across several Midwestern states. Even as the water receded in Green Bay, other parts of the Midwest are still under water or are bracing for flooding. In far southwestern Iowa, residents were being evacuated Sunday as floodwaters overtopped levees. And in St. Joseph, Missouri, volunteers are filling sandbags to help secure a levee protecting an industrial area. Green Bay Metro Fire Department lifted its emergency evacuation order at 10 a.m. Sunday for an eight- to 10-block area around the East River. The Green Bay Press Gazette reports city inspectors were out placing placards on front doors identifying those not currently inhabitable because they have no heat and those that are safe to re-enter. Flooding along the Missouri River is causing long delays for Amtrak passengers. The passenger rail service said Sunday that its Missouri River Runner service between St. Louis and Kansas City, Missouri, will have delays up to five hours because of flooding and rail congestion. Amtrak says all Missouri River Runner trains will be canceled Monday. The service typically travels twice daily between Missouri's two metropolitan areas. Residents in parts of southwestern Iowa are being urged to leave their homes as a torrent of Missouri River water flows over and through levees. Heavy rainfall and snowmelt forced river levels across four Midwestern states to dangerous levels. Two deaths were blamed on the high and forceful water, and two other men have been missing for days. While river levels on Sunday were starting to level off in Nebraska, residents in Iowa, Kansas, Missouri were bracing for the worst still yet to come. Flooding has also been reported in Illinois, Minnesota, South Dakota and Wisconsin. The Missouri River reached a record 30.2 feet (9.2 meters) Sunday in Fremont County, Iowa, in the state's far southwestern corner. People in parts of Bartlett and Thurman were being evacuated as water broke through or overtopped levees. County Emergency Management Director Mike Crecelius says it isn't just the amount of water, it's the swiftness of the current that creates a danger. 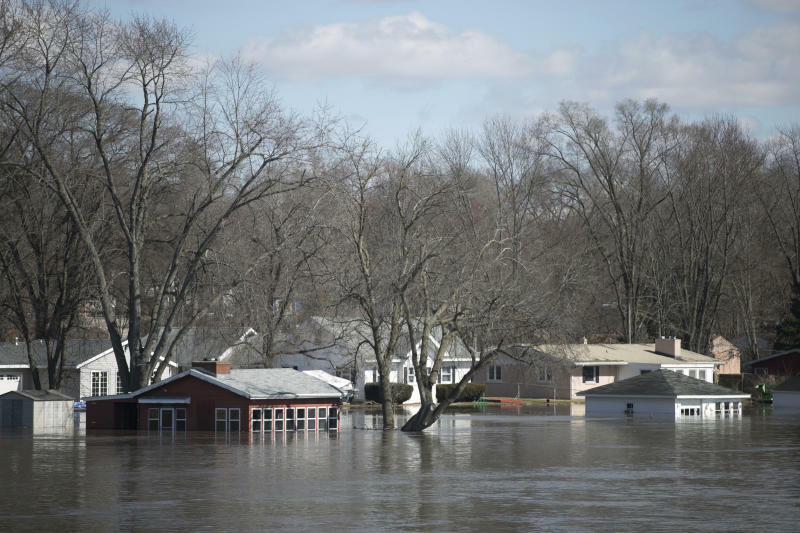 Flooding caused by heavy rain and snowmelt is blamed for two deaths in the Midwest, and two others are missing. Who's got the edge in the SEC race?